Chakra yoga helps you become aware of your body's subtle energy system and aids in opening and balancing your chakras! When your chakras are open and balanced, perfect health is the result. Most of us have heard of using yoga as a healing modality, if done in a open, aware and meditative fashion. Yoga is well-known as a way of transforming lives. Often, however, we in the West have not really understood why it is that yoga works. We just know that it works. For me, I have always known that when you practice yoga or other mindful movements, you move your "energy." But do we really know what this energy movement is all about? I hope to help you better understand this concept. This is "chakra yoga." While you can read lots of material about the chakras, and what they are, unfortunately the information is often shrouded in unfamiliar Sanskrit and other eastern language terms. This is my explanation of what it all means to me, in plain English! Almost all cultures have recognized a subtle energy system in the human body. They have given this energy different names: Prana, from India and Tibet, Qi or Chi from China, Pneuma from the Greeks, Mana from the Polynesians and Ruah from the Hebrew, which means, "breath of life." I am not sure when our Western culture dismissed all this. Probably with the advent of "science." However, in my view, the subtle body does not conflict with science at all! The ancients from the East discovered that the physical body has very distinct energy systems within it. Whether the origins of this wisdom came from Chinese medicine, or East Indian yoga, it matters not. The Chinese say the movement of the Qi in the body moves along lines, or meridians. The Indians describe the subtle body energy, or Prana, as primarily existing in major chakras, or energy "wheels" with the body. It is interesting that two cultures, separate from one another came to similar if not the same conclusions. Chakra yoga then, is the fine art of focusing on a specific energy center in your body, or chakra, to bring this more subtle physical energy from this area into your consciousness. Energy can become stuck in a particular chakra. When you do chakra yoga, you focus on each and every energy center of the subtle body. With this intention and focus, you are opening your chakras, and balancing your chakras in order to become whole. 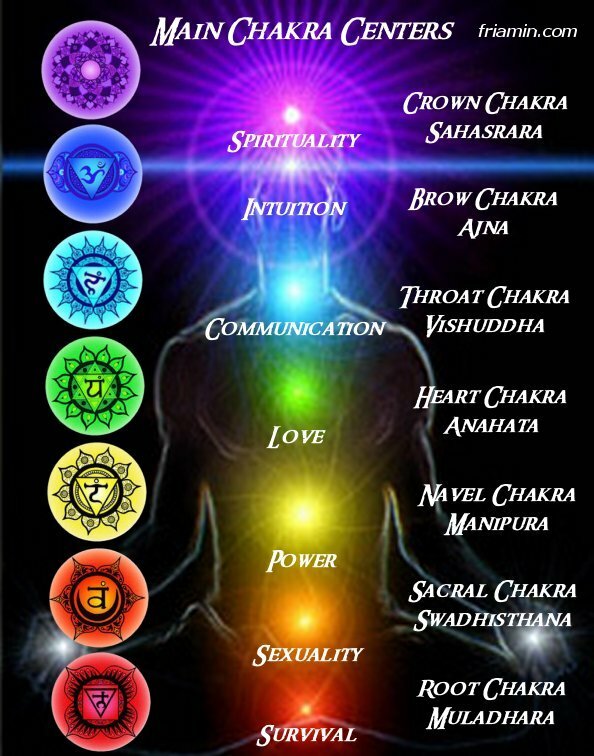 Chakra balance is important, so that your prana, or life force energy flows freely throughout your body. When we in the West speak of "energy" as it relates to our bodies, we speak of something nebulous that perhaps our minds create. Or maybe our minds don't create it. We just know that either we have energy or we do not. So where does this "energy" come from? How do we create it? Do we just have energy by virtue of being alive? And if this is true, why do we cease to "have" energy, or cease to have enough of it? We know that certain people or situations "give" us energy. We become happier and more motivated when we are with certain people, or when we're doing certain activities. The term "vibration" becomes important in light of the fact that the frequency of the spinning of the chakras, creates different levels of energy. But what makes the chakras spin? It is said that certain people have a higher level of vibration, and that is what we are picking up on. The levels of energy are higher, therefore their energy is affecting us. Why is this so? We can raise our own energy levels and our own vibration when we are doing what our emotions interpret as fulfilling, or life-giving. Why is this so? What is vibration? Is it merely energy? Perhaps so. We definitely know from a purely medical perspective that nerve impulses travel along our nerves and through our bodies. In the same way, pulses of blood travel from our heart to the outer most reaches of our cells and back again. This "energy" must flow in order to have life. These electrical and mechanical pulses can be felt and measured. I totally believe that within us, is an innate, subtle body of energy. In the West we have lost this contact with our subtle, internal selves, our internal energy system. When we learn how to be sensitive to our subtle, energy body we can heal ourselves and heal our bodies. When we become blocked in our minds, usually it is because our emotions have created blockages in our subtle body. So back to how yoga, or more specifically, how chakra yoga ties into all this. I believe that when you do yoga in a therapeutic manner, you are moving your chakra energy, and removing your blockages. Since we know that emotions are stored in the body, those that are negative create the blockages in the subtle body. The chakra yoga system is a way of looking at this energy. 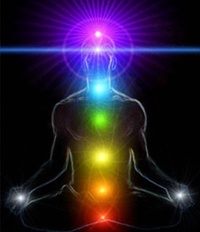 Chakra balance can be achieved if you understand your personal energy blockages. Whether you believe in a literal meaning of the chakra system of subtle energy in the body or not, you will still benefit by doing chakra yoga. Doing physical postures or asanas, definitely moves your energy, regardless of how you chose to define this energy movement. The beauty of doing asanas for this energy movement, is that you don't have to think about it. It just happens. This is why yoga works. This is why I know that even when you don't understand what is going on, your body can lead you in your healing! It is because you are changing your body's subtle energy system. This is developing intuition by using your body! You are moving your energy for healing, in a way that your mind does not have to know about! For me personally, I really like the chakra yoga energy description. Once you know and understand about the different subtle energy centers, balancing your chakras gives you a more definitive way to zero in on a specific area for healing. It just puts it all into a wonderful framework for me. The "wheels" of energy, or chakras that move within our bodies create distinct areas that our emotions influence. Emotions are "energy" that is created when our minds perceive something it believes is real. Then this energy swirls with your chakra to change its flow. The energy can be positive, leading you to a higher vibration, or a more peaceful way of being. Or, the energy flow can be negative, lowering your vibration and happiness. If your negative energy is persistent, then this energy gets trapped in a certain area, to eventually create dis-harmony and dis-ease. The reason negative emotions get stuck in certain areas is from pre-existing and cultural "wheels" of belief. The East Indian descriptive energy system is most similar to what I have learned from the West. My entire nursing curriculum in the late '80's was based on the now famous Maslow's Hierarchy of Needs. 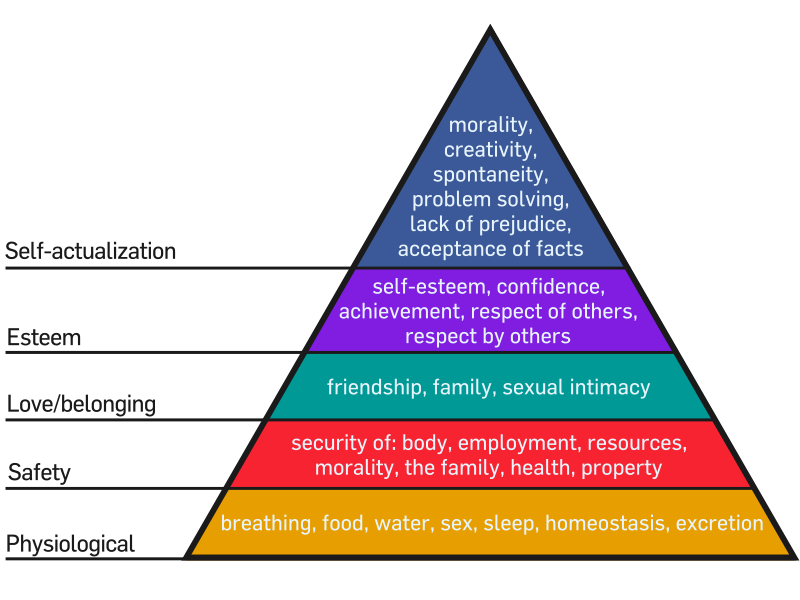 This hierarchy is a way of understanding the human system. Abraham Maslow was a 20th century American and humanist psychologist who created a system to understand the psychological needs of individuals. These needs are categorized into five levels that build upon the prior level. He also describes what happens at each of the levels if these needs are unfulfilled. From the first level, consisting of our basic needs for survival (like water, food and shelter), to the "highest" level of what he calls self-actualization, we all have needs that must be met. In order to "advance" to a "higher" level, the "lower" level needs must be met. Whether or not Maslow was influenced by Eastern philosophy, I don't know, but the similarities to the chakras are remarkable. The Chakra system of the subtle body is described in the same manner, only now, "energy" spins within a wheel at each level, in distinct points within our physical bodies. Seven major wheels to be exact, located at seven different levels along the spine. Instead of a unidirectional flow of energy, channels along the spine interconnect in both directions. The rising energy up the spine is considered liberating, and energy moving downward through the spine is considered manifesting. The sacred number seven is an interesting phenomenon when you consider that there are seven colors of the rainbow, and seven notes to the musical scale. Each of these colors and notes correspond with a chakra level, according to Hindu and Buddhist thought, to create a perfect harmony within the whole being, if the chakras are open and balanced. Because sound and vibration are synonymous, this is how the term "vibration" was coined to describe the level of energy in the human system. The lower a musical note, the lower is its vibration, or frequency. And the colors of the rainbow, red, orange, yellow, green, blue, indigo and violet, that we all learned in high school science class, each carry their own frequencies and wavelength as well, and therefore, energy! The sacred number seven is also seen in the writings of a 16th Century Catholic nun and mystic, Teresa of Avila. In her book, "The Interior Castle" she describes the seven mansions of the soul. Her Castle of the Soul is experienced through seven stages of consciousness and deeper levels of prayer at each stage as the person finds union with God. In the Jewish mystic tradition, there is a spiritual text known as the Zohar. It was written perhaps, in the 2nd or 3rd century by a mystic rabbi. In it contained the Tree of Life, a symbolic description of the seven levels of heaven, and the seven levels of hell. The purpose, again of this mystic journey, was to help the soul find unity with the Divine. Interesting similarities, don't you think? The word "yoga" means "yoke" or union. The call to the soul, in chakra yoga, is to find spiritual empowerment at each level, or each chakra, as you seek union with God. Within most religions, the mystics have essentially taught the same principles, for discovering God. The Chakra Yoga system is one, and for me, a beautiful frame of reference for finding enlightenment, and union with God. It is a system, in my opinion, that marries well with any religious thought. I hope my illustrations, have opened your heart to this understanding. In order to have body-mind-soul health, one must keep the chakras open and balanced so that energy can flow in both directions. Chakra balance, as an explanation for "energy" makes more sense to me than Maslow's, because I have never believed that we are merely psychological systems. Any system that refuses to acknowledge the physical body and it's more subtle energy will never work for me. The subtle energy, is of a mystical origin anyway, which leads one to matters of the soul. Of course, I have explained chakra energy in very simplistic manner. In reality, the human system has many more wheels, like a secondary but powerful one in the hands. There are many more channels of energy than are called nadis. In addition to the chakras, energy also moves along these "lesser" channels or meridians. It is too complicated a system for discussion of the lesser chakras and nadis here. I have created a series of seven articles describing each and every chakra, where they are located, their purpose and function in the human subtle body system and how you can find chakra balance at each level. Through the practice of chakra yoga, you will discover how balancing your chakras can be achieved. I prescribe yoga postures (asanas) and other meditative activities for opening and balancing your chakras at each level. First and foremost, you should start with the heart Chakra. The heart is the connection of all things and is the bridge between all. May you find my chakra healing meditations to be helpful in your journey for body-mind-soul health when you do chakra yoga! If you are committed to dramatically changing your body-mind-soul health, you can now save BIG when you purchase a package of ALL SEVEN of my Chakra Healing Meditation Videos. Each Chakra Yoga Healing Meditation is approximately 15 minutes long, so the package contains over 100 hours of yoga meditation time. Also included is a complete guide for each meditation, for a total of seven guides, in PDF format, to accompany each video. Each guide explains the function of the chakra, explains the yoga poses for each, and suggests affirmations to assist you during your meditation. This package is a perfect choice, so you have an ongoing digital library of yoga meditations that you can select depending on your needs for that day! This package represents a savings of 30% from buying each meditation separately at $4.99 US Dollars each. If you wish to buy one particular chakra healing meditation, please click on the individual listing, above. This is a digital product only for immediate download.